Lately, in case you haven’t noticed, my heart has just not been in the blog. I think I hit some kind of two year wall. I’ve been limping along with an occasional post about some music or some funny valentines or the old reliable kidspeak, but that’s mostly been about poking my head out to keep in touch with you all. I’ve been thinking lately that maybe this blogging and writing thing really isn’t my thing—that maybe it was time to give up the blogging ghost. So obviously I have not been channeling my energy into the blog, but where has it been going? Well, my friends, I’ve actually completed something on my to do list. No, really, I have. Some of you may recall my little curtain dilemma. Well, after an exhaustive search, I finally gave up on finding the perfect curtains and decided to go with those neutral oatmealy ones. Only since I decided this nearly three months after my purchase of the original neutral oatmealy ones, when I went to Target last week, they were clearancing out the neutral oatmealy ones and were completely out of the 84″ length ones. They did, however, have 95″ ones, which were entirely too long for my windows, but were also on clearance for $6 a panel. So I did the unthinkable. I purchased them with the express intent of altering them to fit my window. Yes, another project. To go unfinished. But I didn’t unfinish it, people. I so opposite of unfinished it! I opposite of unfinished the heck out of it. I can’t say that I LOVE the curtains. I’m still not real crazy about the color or the tieback look (it just really seemed to need something to break up the neutrally oatmeal going on there). 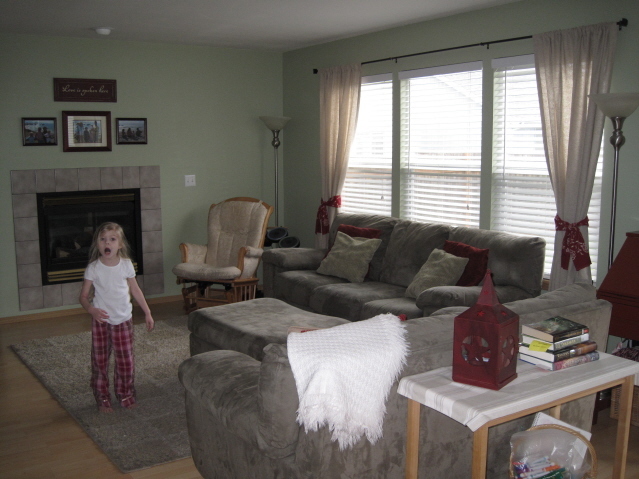 And heaven knows, my home decorating skills in general leave a lot to be desired (matchy match much?). But I think I just decided that I can’t go through life waiting around for the perfect curtains all the while lamenting my lack of perfect curtainness. I need to be more proactive—work with what I’ve got, make the most of it, be happy, blah, blah, blah. 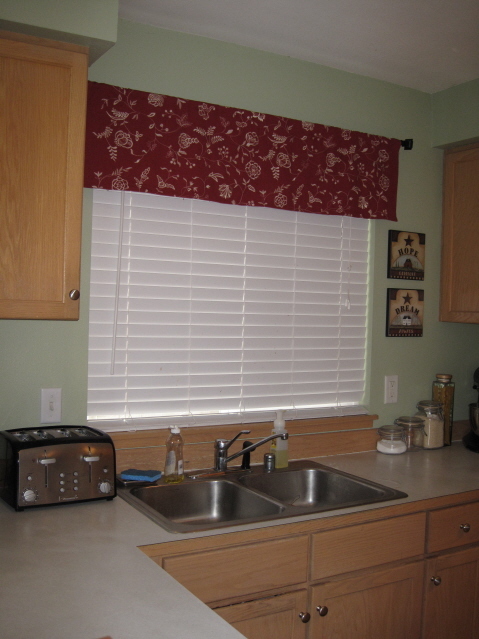 And I do love the kitchen valance and that I no longer have two different sets of curtains on the same wall. But most of all, I love that I finished a project—a project which included measuring, cutting, ironing, pinning, hemming, bobbin thread loading (times 6 because my sewing machine and I have a somewhat dysfunctional relationship), sewing and curtain rod hanging, no less! It gives me hope for the future. What’s giving you hope for the future? Just knowing there are people out there who can make curtains gives me hope. I think the curtains look great. I particularly like the look of shock on BigHugs’ face in the first pic. I love them! Red is a gorgeous color. Ooh, I’m so proud of you! Seriously. 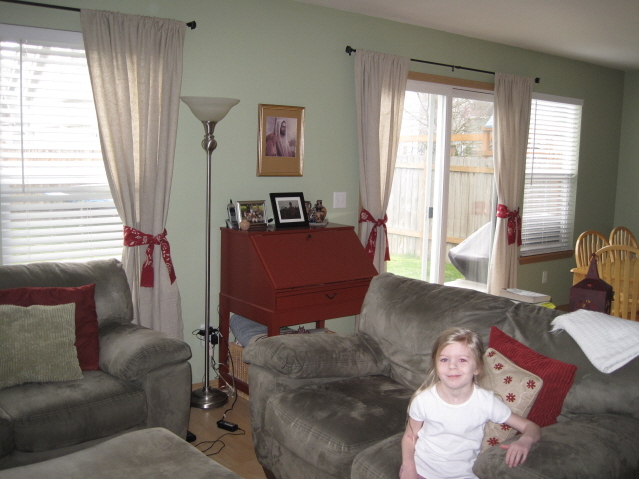 I really like how they turned out…and the valance/tieback thing is clever. If I was crafty like you, I think I might stitch that onto a pillow. PS- I’ve read ALL your archives before (every lovin’ one!) and I agree that you can’t give up the blogging ghost. Your blog is one of my very faves!!! I like them too and the valance. My windows are all matchy matchy too. Everything else is eclectic (by which I mean inherited or stolen randomly). I started to type out my hope for the future but then I was afraid of jinxing it and so I deleted it. I am afraid to write, talk or plan about this thing. My hope for the future? It is closer to bedtime than it was at 4 am. My blo mo jo (nope…not better if you space it out…) seems to be back, so there’s hope for all! Susan—I am not too humble to admit that I can sew in a straightish line. foo—Thanks. Yes, the look of shock is perfect for the occasion. Mad—Your mojoless blogs are more than most people dare dream of. Mother—Everything I write is a life metaphor. And thank you. Evita—I am now dying to know about this thing, but I will wait until it happens and you can share the good news without worry of the jinxing. Shaz—4 am?? Why the ungodly hour? Tawnya—Yeah, there’s no saving that phrase. And you are so working the blog magic right now, girl. That. Is. Amazing. And as both a mother and loather of dishes, I’m speaking entirely without irony here. Oh, and I love that you have both DISH soap and HAND soap by the sink. That is so me. And I love that, too. Thanks for all the love! And doesn’t everyone have dish soap and hand soap?? That was my thought, as well! I’ve been to many a house where they just wash their hands with dish soap. Which is fine, but I love when there’s BOTH.